Even with joblessness on the severe decline, high corporate profits and a booming stock market, at least 40% of U.S. households cannot pay the basics of rent, transportation, child care and a cellphone. This according to a new study by the United Way. The study found many working U.S. households that live above the official poverty line, but below the cost of paying ordinary expenses. Based on 2016 data, there were 34.7 million households in that group — double the 16.1 million that are in actual poverty. Near the high end of the United Way survey are elementary school teachers, earning an average of $29.51 an hour. The United Way study, Thursday, suggests that the economically forgotten are a far bigger group than many studies assume and appear to be growing larger despite the improving economy.The study dubs that middle group between poverty and the middle class “ALICE” families, for Asset-limited, Income-constrained, Employed. These are households with adults who are working but earning too little — 66% of Americans earn less than $20 an hour, or about $40,000 a year if they are working full time. 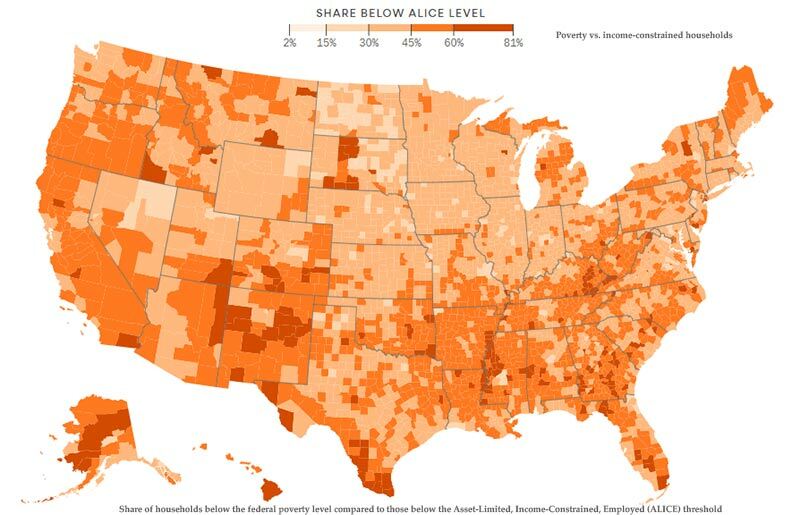 When you add ALICE families with the people living in poverty, you get 51 million households. “It’s a magnitude of financial hardship that we haven’t been able to capture until now,” the report said. Using 2016 data collected from the states, the study found that North Dakota has the smallest population of combined poor and ALICE families, at 32% of its households. The largest is 49%, in California, Hawaii and New Mexico.